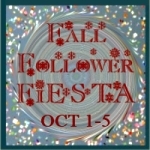 Welcome to the Fall Follower Fiesta! This 5 day event is sponsored by A Goddess of Frugality and Finger Click Saver. We truly appreciate all of our fans and followers and would like to thank you. This event will run from October 1-5th. Please enter the great giveaways we have going on each day. October 5th-Coupons and Amazon (2 envelopes full of coupons and $10 in Amazon credit-one winner)-Open to U.S. only Sponsors: Save and Share with Coupons, Conversations with Carolyn, Wishful Thinking 247, and Texas Frugality. All giveaways will be open on both blogs (A Goddess of Frugality and Finger Click Saver). You only need to enter from one of the blogs. Good Luck!